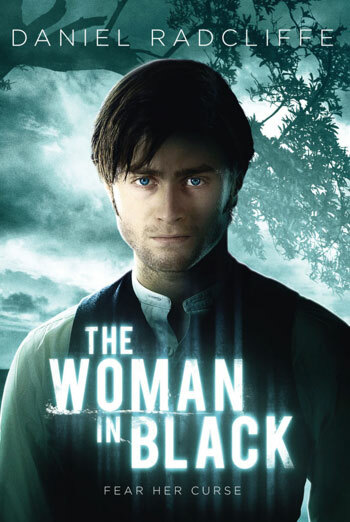 THE WOMAN IN BLACK is a horror drama, based on the ghost story by Susan Hill, in which a young lawyer travels to a remote rural village where he discovers a vengeful ghost responsible for the deaths of local children. There are a number of scenes of supernatural horror and threat in which the ghost of the 'woman in black', as well as the ghosts of her victims, appear to and threaten the central character and others. The general tone of the film is quite bleak and the premise of a ghost manipulating children into harming or killing themselves, make this a potentially disturbing feature for young children. The film also includes a scene in which the ghost of the 'woman in black' appears to hang herself from a noose. It also includes a scene in which a young girl smashes an oil lamp, causing herself to burst into flames. Both these scenes were reduced in order to achieve a '12A' classification. In another scene, a girl coughs up blood after ingesting caustic soda. The film also contains repeated verbal and visual references to a young boy drowning in a muddy swamp, to a mother dying in childbirth and some dated references to 'harlot'. Distributor chose to reduce moments of strong violence / horror in order to achieve a '12A' classification. Cuts made in line with BBFC Guidelines and policy. A '15' classification without cuts was available.